Pennsylvania, officially the Commonwealth of Pennsylvania, is a U.S. state that is located in the Northeastern and Mid-Atlantic regions of the United States, and the Great Lakes region. The state borders Delaware to the southeast, Maryland to the south, West Virginia to the southwest, Ohio to the west, Lake Erie and Ontario, Canada to the northwest, the State of New York to the north and New Jersey to the east. The Appalachian Mountains run through the middle of the state. This state was named to honor Admiral William Penn and his son, William Penn, Pennsylvania's founder. In honor of Adm. Sir William Penn, father of William Penn. It means "Penn's Woodland." 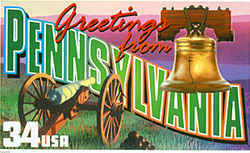 The name Pennsylvania was specified in the charter given to William Penn by England's Charles II in 1680. The Latin Sylvania meaning "woodlands" was added to Penn to create "Penn's woods." Pennsylvania American colony, later U.S. state, 1681, lit. "Penn's Woods," a hybrid formed from the surname Penn (Welsh, lit. "head") + L. sylvania (see sylvan). Not named for William Penn, the proprietor, but, on suggestion of Charles II, for Penn's late father, Admiral William Penn (1621-70), who had lent the king the money that was repaid in the form of land for a Quaker settlement in America. Penn wanted to call it New Wales, but the king's secretary, a Welshman of orthodox religion, wouldn't hear of it. Pennsylvania Dutch is attested from 1824. Pennsylvanian in ref. to a geological system is attested from 1891.
sylvan 1565, "deity of the woods," from M.Fr. sylvain, from L. silvanus "pertaining to wood or forest" (originally only in silvan? "goddesses of the woods"), from silva "wood, forest, grove," of unknown origin. Adj. meaning "of the woods" is attested from 1580. Silvanus was used by the Romans as the proper name of a god of woods and fields, identified with Pan. Spelling with -y- infl. by Gk. hyle "forest," from which the L. word was supposed to derive. The word "keystone" comes from architecture and refers to the central, wedge-shaped stone in an arch, which holds all the other stones in place. The application of the term "Keystone State" to Pennsylvania cannot be traced to any single source. It was commonly accepted soon after 1800. At a Jefferson Republican victory rally in October 1802, Pennsylvania was toasted as "the keystone in the federal union," and in the newspaper Aurora the following year the state was referred to as "the keystone in the democratic arch." The modern persistence of this designation is justified in view of the key position of Pennsylvania in the economic, social, and political development of the United States. Pennsylvania shares with Virginia, Kentucky and Massachusetts the designation "Commonwealth." The word is of English derivation and refers to the common "weal" or well-being of the public. The State Seal of Pennsylvania does not use the term, but it is a traditional, official designation used in referring to the state, and legal processes are in the name of the Commonwealth. In 1776, our first state constitution referred to Pennsylvania as both "Commonwealth" and "State," a pattern of usage that was perpetuated in the constitutions of 1790, 1838, 1874, and 1968. Today, "State" and "Commonwealth" are correctly used interchangeably. The distinction between them has been held to have no legal significance. 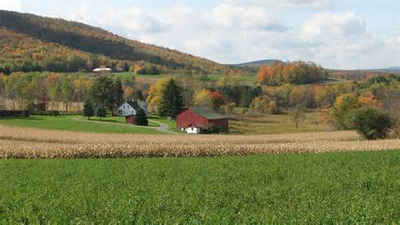 Pennsylvania, the birthplace of independence and the Constitution. Philadelphia is known as "The Quaker City", a name which was sometimes been transferred to Pennsylvania itself as the Quaker State. This nickname represented one of Pennsylvania's three greatest industries. Today, Quaker State oil is a well-known brand. The industry of Pennsylvania once gave it the nicknames of the Coal State and Steel State, but these have long drifted into oblivion.